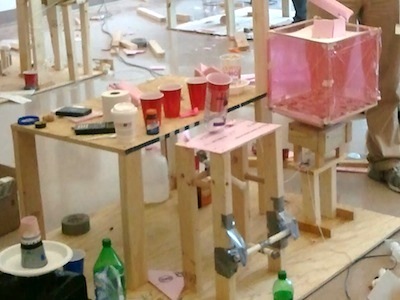 The Rube Goldberg Competition is STWing's annual student contest for the best creative device following the ideas of Rube Goldberg. You and your team will try to build the best contraption that can complete a simple task in the craziest and most circuitous way possible. Rube Goldberg drew cartoons of machines that took far too many steps to complete a simple task. Despite their impracticality, many machines have been built based on his ideas. For more information on these machines, visit the official Rube Goldberg website. This year, the STWing Rube Goldberg Competition will take place the weekend of February 28th-March 1st in the 1938 Lounge of Kings Court English College House. See our schedule for more details. 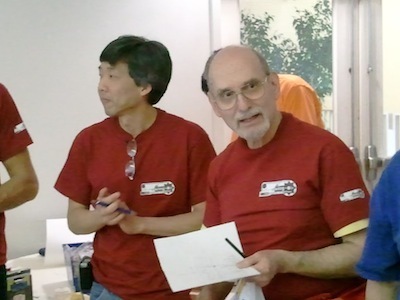 The Rube Goldberg Competition is open to all students at Penn. Students will compete in teams of 3 or 4. Sign up now! Sign-ups are individual, but for those with team preferences, please inform us by email. Tools and a large amount of materials will be provided. The contraptions will be judged based on task completion and creativity, and prizes will be awarded to the top three teams. The competition is completely covered by STWing, all you need to bring is yourself! RSVP to our event on Facebook !